Amelia Anckarström (Krassimira Stoyanova) and Gustav III, King of Sweden (Piotr Beczala). Photo by Ken Howard. During the first intermission of San Diego Opera’s A Masked Ball last night, I found myself in the lobby of Civic Theater telling people I felt as if I had been transported back to the old Met in 1958. At least one person thought I was talking about Lincoln Center — but, no — I was recalling the Metropolitan Opera House on Broadway between 39th and 40th Streets. This monument to America’s golden age of opera was stupidly demolished in 1967. Of course, in 1958 people were already complaining that opera’s golden age was already solidly in the past, but the ’50s were golden enough for me. Singers ruled, and generally speaking, stage directors had not yet decided to muck about with radically progressive production concepts. When I saw Maria Callas and Richard Tucker in Lucia di Lammermoor, the thrills came from the performers, not from the musty literalist sets and costumes, and certainly not from any innovative stage direction. Last night Verdi’s Un ballo in maschera belonged to the singers, the conductor, the orchestra and the chorus, and I couldn’t have been more delighted. It was like being transported back to another era. There was nothing at all distinguished about the sets which are meant to represent the palace and environs of the Court of the King of Sweden, circa 1792. You might have seen sets like these at the Met in the ‘50s. You might also have seen something like John Conklin’s period costumes too, although I confess these are indeed handsome creations, with strikingly balanced, bright colors and plush textures. 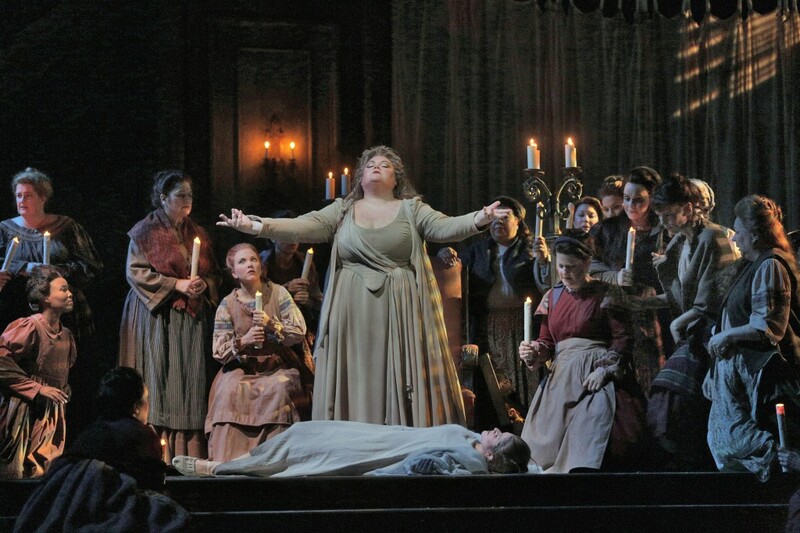 My point is, this traditional looking production, directed with all the competence one would expect from an old pro like Lesley Koenig, did not begin in a giant bathroom with everyone sitting on toilets as in the case of Calixto Bieito’s now infamous Un ballo in Barcelona. (I hereby provide a You Tube link to the opening of that Un ballo for the curious, but one must wait a moment or two for the curtain to rise to see what I mean.) San Diego’s current A Masked Ball is just the way most San Diegans like it, or so I have observed. It is totally conservative, without any progressive “director’s theater” nonsense whatsoever. Personally, I enjoy avant-garde Regietheater when it works, but sometimes there’s nothing like an old fashioned sing-fest. Both a fabulous singer and no stranger to far-out productions (nor a particular fan of them either, or so I hear), Polish tenor Piotr Beczala starred recently in the Met’s “Rat Pack” Rigoletto set in Las Vegas, with Beczala impersonating a sort of Sinatra-like entertainer in a white dinner jacket. 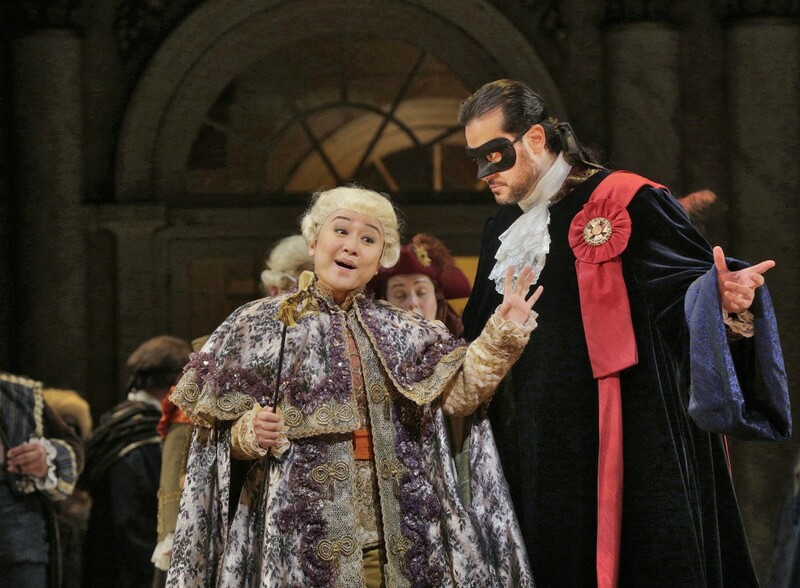 Because he is now one of the most justly celebrated tenors in the business, we are truly lucky to have him here singing the leading role of Gustav III (Riccardo) whose clandestine love affair leads to his assassination during the gala ballo of the opera’s title. It’s not a good idea to carry on with your best friend’s wife, especially when you need allies whilst numerous conspirators are skulking about looking for a good way to kill you. Nonetheless, Gustav loves Amelia (Countess Anckarström), sung with great vibrancy and true Verdian excitement by Bulgarian soprano Krassimira Stoyanova. Gustav thereby radically alienates his closest friend, Count Anckarström (Renato), sung by Greek-born Aris Argiris, a Verdi baritone to the manner born. He gets to sing the famous aria “Eri tu!” by the way, which, by an amazing coincidence is the answer to a clue in this morning’s New York Time’s Sunday crossword puzzle. I imagine “Eri tu!” (“It was you!) belongs in the Guinness Book of World Records for the operatic aria most often cited in the entire history of crosswords. 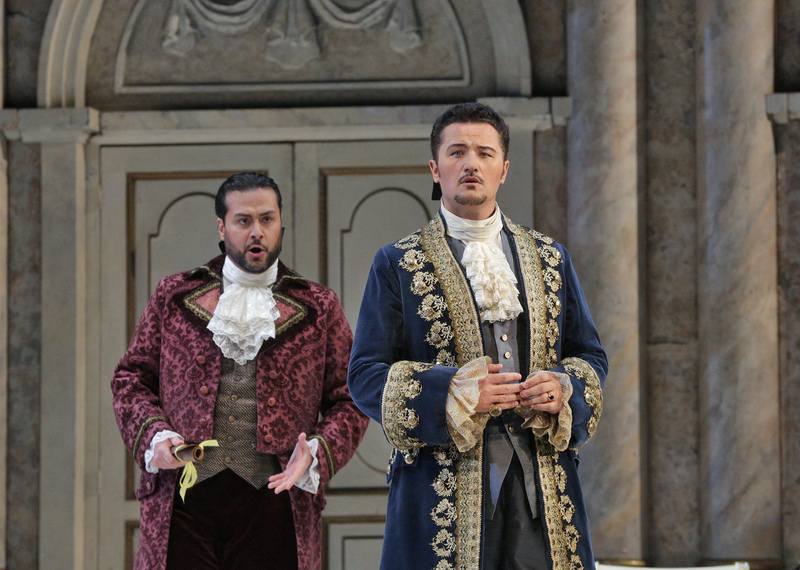 Renato (Aris Argiris) and Gustav/Riccardo (Piotr Beczala). Photo by Ken Howard. So, San Diego Opera has got three great principals: Piotr Beczala, a virile, confident leading man with a glorious tenor voice that is even sounding from one end of the spectrum to the other; Krassimira Stoyanova, a stage savvy leading lady with the temperamental and vocal requirements for a complex Verdi heroine; and Aris Argiris, a sturdy “heavy” with good looks, a fine stage presence, and a voice of considerable power. But Un ballo has two other amazing roles and I cannot recall ever in my life having heard them better sung as in this production. These are known to many opera lovers as the roles of Ulrica and Oscar, and I really do need to explain that the Italianate names, rather than the Swedish ones, are the ones we Un ballo lovers use. The opera’s original censorship problems caused the action to be moved from Sweden to Boston at one point, and the Boston-Italian is much more musical than the clumsy Swedish names. In any case, the fortune teller, Madame Arvidson (Ulrica), is one of the great short roles in opera. The entire second scene of Act One revolves about her and is set in her darkened dwelling. She is to be banished from the kingdom because of her literally Satanic connections, but both the elite and the hoi polloi have been flocking to her for consultations. She accurately predicts Riccardo’s fate and tells Amelia where to find an herb (under the gallows!) that will cure her of her adulterous urgings, although things do not work out so well with this little plan. Ulrica, the first role to be sung by an African-American woman at the Met (Marian Anderson in 1955), is a plum part, and you will never hear or see a more compelling performance of it than the one American mezzo-soprano Stephanie Blythe is privileging us with here this week in San Diego. With apologies to the Gods of Critical Clichés, it alone is worth the price of admission. There is no other voice like this one. It is in a category of its own. 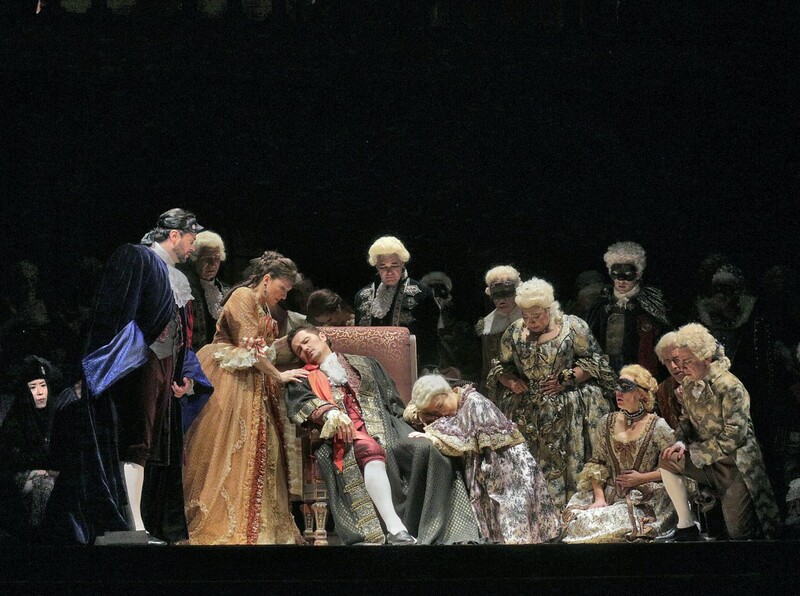 Thanks to Italian conductor Massimo Zanetti leading the San Diego Symphony Orchestra in the pit, this fortune telling scene (Act One, Scene Two as mentioned above) began with three tremendous crashes, the first of which had some audience members literally jumping up in their seats. Zanetti surprised me by giving the entire score much of the propulsive drive I am used to from my old Toscanini recording, but he also seemed more sensitive to detail than that now immortal maestro, and more aware of the need for dynamic shadings. Under his control, soloists and a chorus that was keyed-up and even more involved than usual, the entire scene truly evoked a Golden Era of opera, with everything going along on a very high musical plane. And the voice of the page-boy Oscar, sung here by Korean-American Kathleen Kim (probably the best Oscar ever, if I may sound for a minute like the Huffington Post), was a glorious fillip on the ensemble. This somewhat intrusive and even mischievous character can be irritating, but I took such pleasure in Kim’s vocalism, I looked forward to her every appearance. Some conspiratorial counts that should be counted include the always excellent American bass Kevin Langan and Egyptian bass-baritone Ashraf Sewailam. Reliable Scott Sikon impresses as Silvano, a sailor trying to get his fortune told after 15 years of lousy luck. The fine, atmospheric lighting is by Gary Marder, and the dancing was overseen by Kenneth von Heidecke, whose final efforts, I must say, are upstaged by all the opera’s intrigue. For those that don’t know this already, it’s Verdi at his best. One marvels at the quality of number after number, and the metaphor of disguise is wonderfully consistent. It lends a serious coherence to a potentially silly and confusing drama. 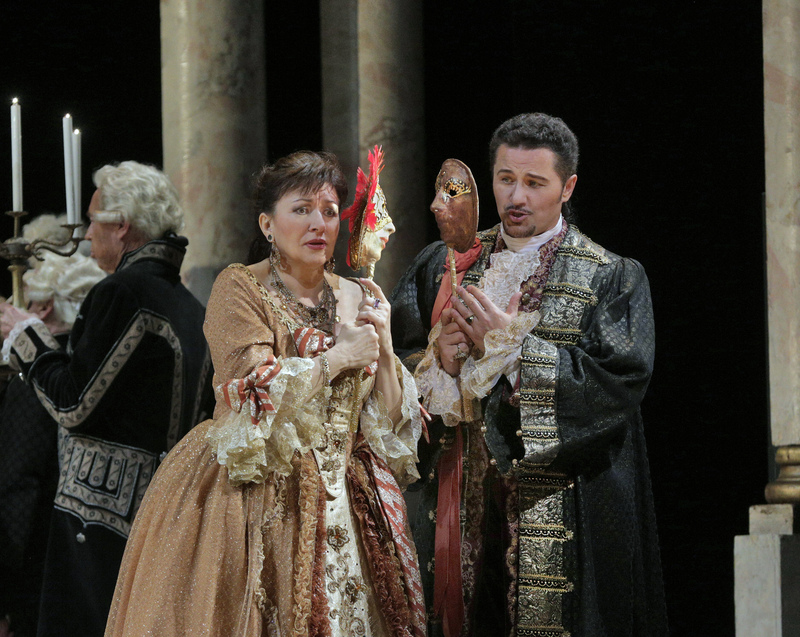 This production sets a high standard for the San Diego Opera. If Ian Campbell is determined to avoid the worldwide trend to innovative stage direction and set design, all he has to do is give us casts like this one and then everybody will be happy. We can revel in the glories of a bygone era. Oscar and Renato. Photo by Ken Howard. Saturday, Mar 8, 7 p.m.
Friday, Mar 14, 7 p.m.
Sunday, Mar 16, 2 p.m.